The only thing I knew about San Diego before last weekend was that it was near the southern border. After driving the quick 2.5 hours south, I was pleasantly surprised to find myself in a beautiful and clean city right on the water, filled with young college students and families. My friend and I stayed in the Gaslamp District, which was conveniently close to the festival and also right in the middle of downtown. Getting an Uber to the venue easy, and on Saturday we only waited about 20 minutes in line. The festival itself was located at Waterfront Park, which is situated right on the water and behind city hall. There was grass everywhere and several water fountains that attendees could walk in. At one point later in the day a guy was breakdancing in one of the shallow water fountains, and the splashing water looked beautiful. As you walk further into the festival, pass "The Palms" stage, you reach the "City Steps" stage. This is where I ended up spending most of my time, and the nearby bars (yay 21+ festivals! ), food, and charging station made it the central hub of the festival. Further in on the way to the main stage you pass the main bar area and some teepees meant for relaxing. You then get to the "Ocean View" stage, which was the largest stage with the most amount of dancing space. The stage design and lighting were impressive, and even if you didn’t like the music, the visuals could keep you occupied. "Ocean View" is where we started our CRSSD adventure by catching H.V.O.B at 2:15 P.M. They were one of the groups I was most excited to see, and they had a great set, playing all their most popular songs. At a festival with mainly electronic producers and DJs, their live drums and vocals added some variety to the lineup. During the last song, we ran over to "City Steps" to see the end of Yotto. I’m so happy we did, because he absolutely killed it. It was a bit clubbier than what I expected, but after the chill H.V.O.B set, we were in the mood to get down. Next up we headed back to "Ocean View" to meet some friends at Giraffage and then trekked over to "The Palms" for Moon Boots. I’m not sure if I had some high expectations or if something was off with the sound, but the general consensus was that Moon Boots was just okay. This was a bit disappointing for a sunset time slot, but no big deal since the legendary Damian Lazarus was after. I’ve never seen Damian Lazarus live, and his tribal sounds and thumping techno kicks blew me away. It also solidified "City Steps" as my favorite stage, although I wish the sound was better. Because it was between "The Palms" and "Ocean View," there was some interference but that was easily solved by getting up close and personal to the DJ booth. My friend was dying to see Lane 8 so we cut Lazarus short and walked over. I thought Lane 8 was beautiful, and it was difficult leaving for Recondite. But, Recondite was the main reason I was desperate to attend CRSSD and so we gathered the crew and headed back over. I was the only one who had heard of Recondite, so I was happy to hear that all my friends thought he was a highlight of the festival. I was in absolute heaven the whole time, sometimes not even dancing because I was so intensely focused on the music. I think the word “experience” sums up his set nicely. Last but certainly not least was Âme, another one of my most anticipated artists. His sound was similar to Damian Lazarus, although a bit more industrial. My friend, who had no idea who Âme was and wasn’t even that big of a techno fan, said Âme’s music was “her heartbeat” (which can I just say is the most adorable praise ever). Although I didn’t get to check out Duke Dumont, my friends did and told me about the amazing visuals CRSSD had at "Ocean View." Apparently, there was some sort of light show with smoke and holograms which made the visuals seem 3-D. I wish I had gotten a chance to check that out! After the end of day one, we were all exhausted, but CRSSD had some sweet after parties including Bob Moses & HVOB and Damian Lazarus & Recondite. I would’ve given my left leg for a ticket to Lazarus & Recondite, but alas they were sold out and we were falling asleep. On Sunday we slept in a bit late and arrived at Waterfront Park for Peggy Gou’s set. The security line ended up being longer than the previous day, so we only caught the last 10 minutes. My friend who had gotten there earlier told me she was amazing, so I’m still a bit bummed we missed her. Next up was Midland, BBC Radio 1’s Mix of the Year Winner. It started to rain a bit more during his set, but in classic Southern California fashion, it just made people dance harder. Then we were seeing Cut Snake, so we decided to take a quick food/bathroom break. We ate some tasty chicken tenders (with no line!) and then headed to the porta-potties which I have to say was one of the easiest bathroom experience at a festival I’ve ever encountered. Waited maybe five minutes for a stall and they stayed (fairly) clean the entire weekend. However, as we were leaving the bathroom disaster struck- my friend’s phone was missing. We ran on over to lost and found, not really expecting them to have it, but alas! Someone had turned in the phone, which impressed me. Although the crowd was friendly the entire weekend, it really speaks volumes when you lose a phone at a festival and someone turns it in. Doesn’t always go down like that, especially for city festivals, so thank you CRSSD crowd for being awesome! Cut Snake and Skream brought the fun house-y vibes, but we had some difficulty hearing the sound over the crowd volume. We were under the stage canopy a bit farther in the back which added to the problem, however the sound generally could have been better throughout the festival. I doubt CRSSD can do anything about this due to the location, but that was the only complaint the entire weekend. We then headed over to "City Steps" for Seth Troxler b2b Eats Everything. If you were at CRSSD and didn’t see this set… I’m sorry friend but you messed up. They were easily the best set of the entire weekend- nonstop dancing, amazing crowd vibes, and of course great music. They played this “Flash” by Green Velvet remix that had everyone singing along and even J.E.S.u.S. played a quick 20-minute set. I was feeling a bit nervous for Rødhåd since Troxler b2b Eats was such a party, but he didn’t disappoint and for some friends, he was even better than the b2b. I, for some unknown reason, couldn’t get as into Rødhåd so I took the opportunity to see some Claude VonStroke and Flume. Claude is always a guaranteed good time and after watching him for 10 minutes we decided to go to his after party. We then checked out Flume and saw the sweet visuals. We left a bit early so we could get tickets to Claude and walked over to Bang Bang. Whoever played before Claude had a great set, and played the new Ardalan remix of “Hello Clouds” that I really like. And of course, Mr. VonStroke himself caused massive percolating all over the dance floor. 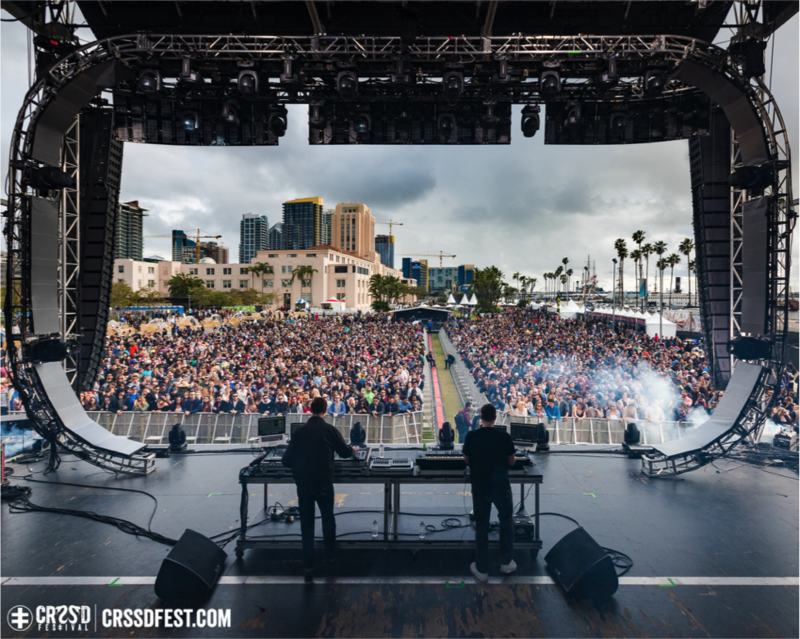 Overall, CRSSD was a truly successful city festival filled with good music and good people. It ran smoothly, was organized with attendee comfort in mind, and even the bad weather couldn’t stop the fun times. Well done CRSSD! Can’t wait till next time. New Adds: Thundercat, Future, Vagabon and more!